High rates of nonunion have recently been reported for midcarpal fusions. Due to curvature and overlap of carpal interfaces, two dimensional films are not reliable in determining union of a midcarpal fusion. Computed tomography is the most reliable radiographic method of evaluating osseous union. Initiating motion as soon as fusion has occurred is a priority with the goal of maximizing final range. Cost control in healthcare makes obtaining serial scans unreasonable. The single optimal time point for a computed tomography scan to determine union of a midcarpal fusion remains to be determined. A prospective protocol selected 8 weeks post operative as the point in time to obtain the single determining scan. 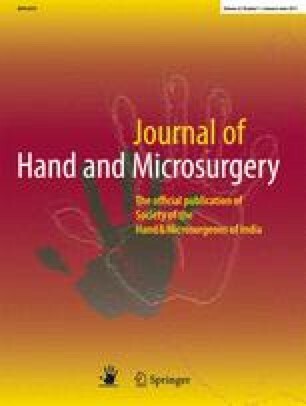 Forty-six consecutive midcarpal fusions with scaphoidectomy were retrospectively analyzed for the reliability of this time point. All fusions had achieved union by 8 weeks and only this one scan was clinically necessary to advance the patients on to full range of motion without a splint at that time.